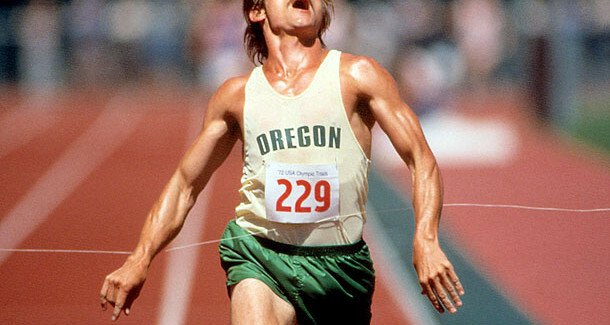 How would Prefontaine have looked at some of Oregon’s races this year? And are we talking about the real Pre or the fictional Pre? The weekend of college track was dominated by the Penn Relays and Drake Relays, meets that drew more than 150,000 fans between them. The most talked-about race of the weekend was doubtlessly the men’s 4 x mile Championship of America race at the Penn Relays. You can read a detailed Let’s Run breakdown, but the short version is this: Oregon anchor Edward Cheserek didn’t want the lead because he was so confident in his kick,and slowed the pace nearly to a walk in an attempt to force Villanova’s Jordan Williamsz to take it. Williamsz didn’t bite, even though “Ches” beat him in a kick in the previous day’s distance medley, and when push came to shove Williamsz ran a 52.0 last lap to lead his team to victory. The crowd booed the slow pace and gamesmanship, but the plan was to do whatever it took to win. Ches does have a big kick, but it’s an age-old truism in track and field that the problem with big kickers is that they lose to other big kickers. Contrast that race with the following conversation. If you don’t recognize this, it’s a scene from Without Limits, the Steve Prefontaine biopic. I think “chickenshit” is too strong a word for Cheserek’s racing strategy. I’d just call it “too clever by half” and point out that it didn’t work, that Oregon lost a race that was theirs for the taking if they’d run an honest race—not just Cheserek, but the three legs before him. No other team in that race could have approached 16:00. Too much gamesmanship gave other teams a chance. I also think it was an important learning moment for Cheserek. 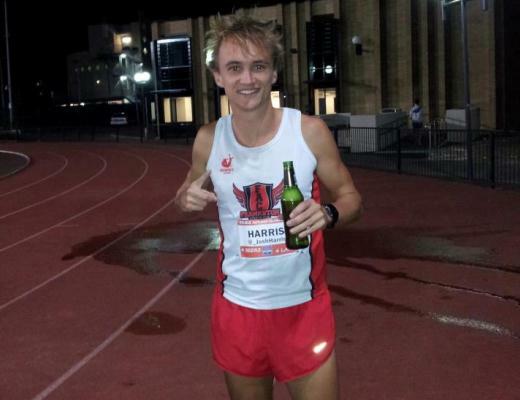 He’s not likely to try to outkick a 1:46 half-miler off a slow pace in the future. As a wise man once said, “fool me once, shame on you. Fool me twice…you can’t get fooled again”. Or something like that. It’s also worth noting that the Prefontaine-Bowerman conversation above is fiction. It never happened, or at least not as depicted in the film. It’s a condensation of many things that both Prefontaine and Bowerman said, to each other or to other people, over a long period of time. The only recorded instance of Prefontaine using the word “chickenshit” in regards to a race was immediately after the three-mile in the 1970 West Germany vs USA dual meet, when a 26-year-old internationally-experienced Harald Norpoth sat on 19-year-old Pre’s shoulder for twelve laps and then blew by him in the last 220. Pre was pissed at being toyed with by a guy who was clearly better than him. The attitude expressed by Billy Crudup playing Steve Prefontaine is played up to some extent for dramatic effect, and reality was a bit more complex. But it’s also worth noting that the Penn Relays is not the first time that Cheserek has been booed this year. At least a few fans jeered him and teammate Eric Jenkins at the Stanford Invitational, where they finished 26th and 27th in just over 29 minutes and were obviously just running, not racing. “[Distance coach Andy] Powell said he wanted his distance aces to save themselves for this week’s Pepsi Team Invitational”, according to The Oregonian’s Ken Goe. So what happened at that meet? Those two plus Will Geoghegan were described as running “on autopilot” in a tri-meet 5000 meters and crossed the line together in 14:00. “We just wanted to go out and get our regional qualifier,” Geoghegan said. It’s fairly obvious that Oregon’s biggest distance stars are trying to get through the season with the minimum amount of effort possible, almost like Dilbert’s Wally tries to get through his work day. Other than Saturday’s foolishness, it’s not terribly interesting to watch—so it may not be an accident that attendance is down at some Oregon meets, including last year’s NCAA Championships. This kind of behavior is not good for track and field. But other than that it’s not aesthetically pleasing, why on earth should these guys run any faster than they have to? What motivation do they have? What do they stand to gain if they run all-out? Absolutely nothing, and everyone knows it. There are a number of huge, endemic problems facing track and field as a spectator sport, and one of them is that nearly every non-championship meet is nothing more than an exhibition. If only a few meets matter, then few will pay attention at any other time–and many won’t pay attention at all, period. So I don’t blame the Oregon coaches at all for this, they’re just following the system of incentives to its logical conclusion. And it also shows why Prefontaine was and is such a cult figure: he viewed racing through a different lens. He went against the conventional wisdom and the crowds loved him for it. We can’t expect others to do things the way he did. That he was unusual is why two movies were made about his life. There will be people who read the above and think I’m criticizing the entire Oregon program. They might even call me a “hater”. Nothing could be further from the truth. In fact, I think Oregon ran the gutsiest and most entertaining race of all of this weekend’s college Championship of America races at Penn, and it did not get the attention it deserved. The sprint medley races at Penn are traditionally held late on Friday. They tend to get ignored. The stadium crowds start to thin out towards the end of the day. I wouldn’t be surprised if the number of people watching the webcast is down once the Friday work day is done. So the sprint medley is always a bit under the radar. The women’s race was expected to be a battle between Oregon and Clemson. The Ducks led off in the 200 meter legs with Jasmine Todd and Jenna Pradini. (You cannot be accused of holding back if you run the world’s fastest sprinter on a medley relay.) The Ducks handed off to the 400 leg with a healthy lead, but it disappeared when Raevyn Rogers split 54.1 against Clemson’s 52.1 and UTech’s 51.7. UTech didn’t have the anchor to be a contender, but Clemson certainly did in Natoya Goule, a three-time NCAA champion at 800 meters. Oregon had Annie Leblanc, who didn’t even qualify to the NCAA indoor championships. But Leblanc had quite the meet last week at the Oregon Relays, where she beat top pros Mary Cain (1500) and Treniere Moser (800) on consecutive days. 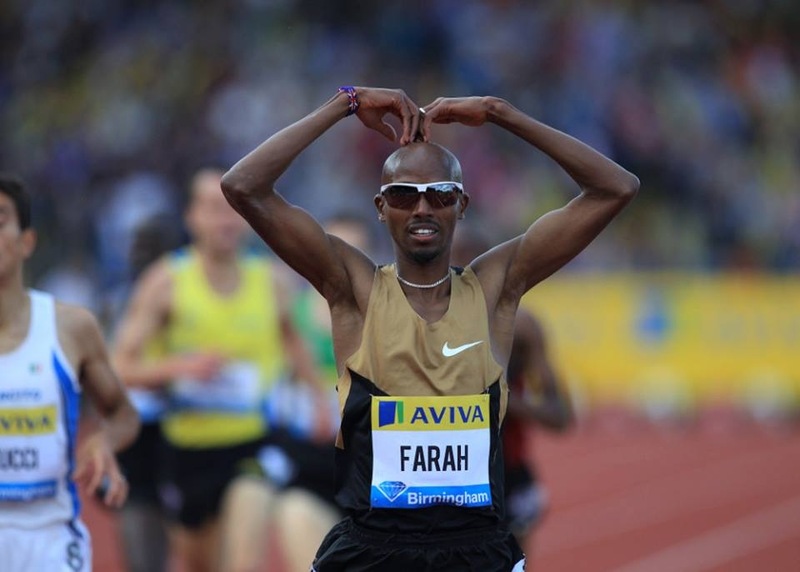 Predictably, Goule immediately the lead and began to stretch it out over the second lap of the 800-meter anchor leg. She was ahead by 10 meters with 200 to go. But somehow, Leblanc began to eat into that lead, halved it by the homestretch, and caught Goule just a step before the finish line. It was one of those pump-your-fist-and-yell-at-the-screen moments. This is why the Penn Relays and Drake Relays and Texas Relays are so wildly popular. These meets stand virtually alone in the college regular season as meets that are not exhibitions. Winning at these meets has intrinsic value, right then and there and not as preparation for something else. Yesterday Ken Goe wrote that “in the big picture, the Penn Relays essentially are a mid-season exhibition”. I disagree. It seems to me that most teams and athletes approach it (and the Drake and Texas Relays) as basically the only mid-season meet that isn’t an exhibition. I don’t know whether Leblanc dug so deep for herself, or the thrill of the chase, or the love of her teammates or the “OREGON” across her chest. But she did, and the Oregon coaches put together the best lineup available, and they all went for it. We need more of that. A relatively new wrinkle in the Drake Relays is the Hy-Vee Cup, a scored competition using the five most popular relays. The winners were the Illinois men (third in a row) and the Arkansas women (their fifth straight win in scored meets). Maybe I’m missing something, but finding the final standings is proving rather difficult. The fact of the matter is that winning is fun. This is a very special day for me because this is one of the races I thought we would have a tremendous challenge with… The last leg was basically full of theater. It was full of exciting moments, and their booing and cheering and hoopla and everything. That’s what it’s all about. It’s the excitement of getting a crowd, it’s entertainment, and you don’t know what the exciting finish is going to be. Last night, I said to the boys, I think I can get him. If the race goes just right, I can get him. I guess it went just right for us… You don’t beat that guy [Cheserek] easily. I’m just still not realizing everything. I was not even thinking about, you know, the wheel, or winning. I was just trying to race people, and chase down other runners. When I saw that straightaway, I just gave it my all. It feels awesome…I never thought I would be here. I competed last year, but I wasn’t able to get into the championships. I got third in the College Open. You are never going to replace an Emily Lipari or a Sheila Reid. You just find a new role and someone steps up. If it wasn’t me, it would have been Angel. That’s what we do at Villanova. On the last home stretch I heard them talking, and I saw the time. I just thought, I need to go for it. At that point, my legs were really numb so I just said, let’s finish it. And as I looked at the clock, we broke the record! The women swept, the men won and the atmosphere was great. Today was one of those days that really makes the Drake Relays special. It was exciting, we’ve been close, we’ve been in the hunt the last three years and it was really exciting. I’m proud of the guys. Crossing the line [in first] with the team was a ten times better feeling. I love the crowd. It’s always nice to see people who love track and field as much as I do. Oh groan. Either way you go on the Prefontaine / Ron Clarke frontrunners-are-heroes issue, you’ll get slammed. Kudos to Harald Norpoth for beating Pre and showing him how it’s done. If a runner isn’t going to go with his strengths – what the heck is he doing? He may become known as biggest peacock, but he won’t win the Olympics (which neither Pre or Ron Clarke did). But you’re right, the tactical season isn’t going to draw viewers. And running all-out, all the time is going to destroy runners. When you face reality and schedule meets and invitations at the right time, maybe you’ll have a decent chance of putting on a great show. Diamond League, anyone? Maybe college track should have a grand league meeting, a mid-term, and the NCAA’s. I dunno.